A group of car dealerships and their president and vice president have settled Federal Trade Commission allegations that they mailed more than 21,000 fake “urgent recall” notices to consumers in 2015 and 2017, to lure them to visit dealerships. The FTC also has agreed to a settlement with a California-based marketing firm and its owner that, according to the complaint, designed the fake recall notices and worked closely with the dealership defendants to send them. According to the FTC, the vast majority of the vehicles covered by the notices did not have open recalls. The court orders settling the FTC’s charges bar all of the defendants from such deceptive conduct in the future. The dealerships do business as Passport Toyota, Passport Nissan of Alexandria, Virginia, and Passport Nissan of Marlow Heights, Maryland. Everett A. Hellmuth, III is the founder and president of the dealerships and Jay A. Klein is their vice president. The marketing company, Temecula Equity Group, LLC, does business as Overflowworks.com, and Jeffrey R. Bush is its founder and CEO. 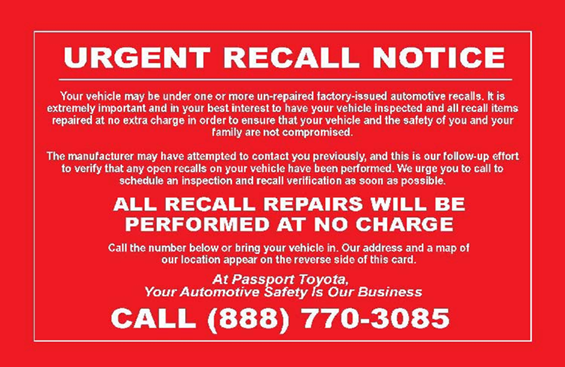 According to the FTC’s complaint, in early 2015 the defendants mailed fake recall notice postcards to nearly 7,000 Toyota owners. The complaint alleges the defendants made no effort to limit the mailing list to consumers whose vehicles were subject to open recalls. The notices warned consumers about supposedly urgent recalls, with prominent language such as “URGENT RECALL NOTICE” in large, bold-faced, uppercase letters. According to the FTC, despite numerous complaints, the defendants sent virtually identical “urgent recall” notices to more than 14,000 Nissan owners in June 2017. The FTC alleges that, as with the Toyota notices, the defendants failed to take steps to ensure that the consumers who received the Nissan notices had vehicles with open recalls – and the vast majority did not. Under the court orders with the FTC, the Passport car dealer defendants and the marketing company defendants are permanently prohibited from misrepresenting, expressly or by implication: 1) whether any motor vehicle is subject to an open safety recall or service campaign, or 2) certain other material facts about motor vehicles. The Commission vote authorizing the staff to file the complaint and proposed stipulated final orders was 4-0, with Commissioner Christine Wilson not participating. The FTC filed the complaint and proposed final orders in the U.S. District Court for the District of Maryland, Southern Division.